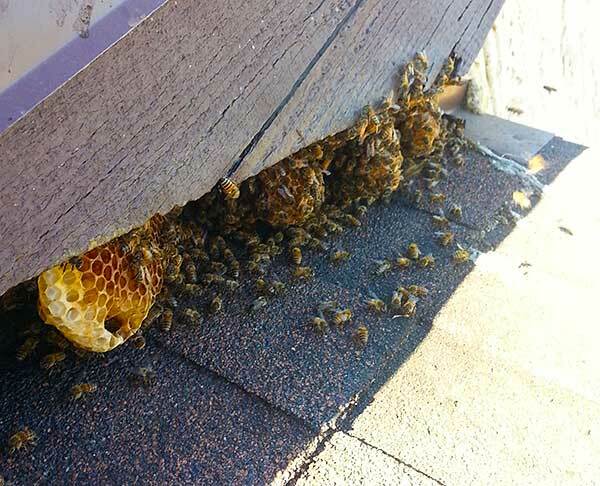 Do you live in Del Mar and are in need of a professional beehive removal company? Look no further than D-Tek Live Bee Removal. We are a bee removal company based out of North County San Diego. We specialize in the safe, humane removal of honey bees. We have a state of the art vacuum system to gently remove the honey bees into a holding chamber. We then transfer the bees into a bee hive box and drop them off to our own apiary here in San Diego. By choosing D-Tek Live Bee Removal to get rid of your honey bee problem in Del Mar you can be assured it will be taken care of quickly and correctly. We proudly stand behind our work and offer guarantees on repairs and the bee proofing/bee control services. All of the above-mentioned steps in the bee removal process are important. The most important of all is the complete removal of all bee hive and honey comb. There is no shortage of pest control companies in San Diego who will simply spray pesticides to exterminate the honey bees. While this may be a cheaper alternative up front it can come back to sting you in the long run. Honey bees have an excellent sense of smell. Leaving bee hive in a structure will leave a scent that they are attracted to. You are at much greater risk of having recurring bee problems if you leave a bee hive in a structure. Once the honey bees are no longer around to tend the hive the honey will often time melt out and can cause damage to your home or business. This can include drywall damage, staining of the stucco, damage to siding, damage to electrical wiring, etc. You may also start having problems with other common household pests showing up to take make a meal of the old bee hive. These can include mice, rats, ants, etc. After the live bee removal has been completed it may be necessary to perform repair work on the structure. Honey bees will often times find their way into attics, walls, floor boards, sheds, etc. When doing a full hive removal it is often necessary to cut into the roof, drywall, or stucco/siding to remove all of the bee hive. D-Tek Live Bee Removal always includes in every price any associated bee removal repairs that may be needed. D-Tek Live Bee Removal stands behind all of our repairs. We guarantee in writing all of our roof, stucco, and siding repairs to be free of defects and leaks. We also guarantee our drywall repairs to blend seamlessly with the surrounding area. D-Tek Live Bee Removal is proud to offer free bee removal inspections to Del Mar. Included with every free estimate and inspection we also give you a copy of our insurance certificate. Give D-Tek Live Bee Removal a call any time day or night. Our direct line is 760-224-3040. Call today! After a live Del Mar bee removal service, we drop the honey bees off at our very own bee farm here in San Diego. We are professional beekeepers who value our bees and the environmental impact they have on our community as well as the healthful byproducts they provide us. Our bee farm has 45 plus well maintained hives that are used to pollinate nearby orchards and fields. We then harvest raw honey, pollen and beeswax from our hives that we offer to the public. Do you own orchards or crops and are looking to purchase or rent a bee hive? We have beehives for sale or rent for pollination services. Don’t waste any more time. Have your bee infestation solved permanently! Call the live bee removal experts at D-Tek today! Our direct line is 760-224-3040. If we don’t answer please leave a message and we WILL call you back. Another way to contact us is to fill the bee removal contact form on the website. We will get back to you as soon as possible and have your bee removal in Del Mar completed generally within 24 hours of first contact. Call today!